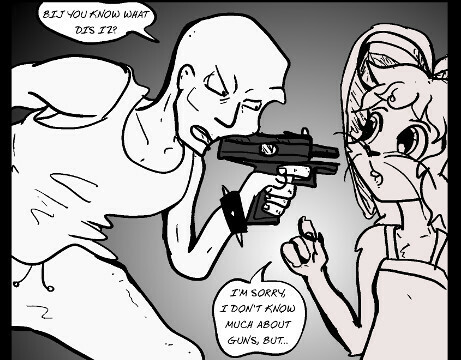 AntiBunny: The Gritty City Stories #266 Loud Silence is now up for your viewing pleasure at http://antibunny.com (Or if you’re having trouble with the regular URL it’s also reachable at http://vinnied.comicgenesis.com ) in which things are turning bad for Penelope. Remember you can also help support the comic by becoming a backer at http://patreon.com and with your contributions I can make the comic even better. There’s a little shakeup happening right now. I came to the decision that Chapter 8 is getting a bit long, and gave the pacing some thought. Ultimately I decided to drop the 3 acts idea, since each story really can stand on its own as a chapter, especially Act 1 which was a full 39 pages its self. As such Act 1 has become the entirety of Chapter 8. Chapter 8 is now titled “July.” Welcome to chapter 9 “August.” That’s right this means that Chapter 9 is already a few pages in. So what of the “Summer in the City” title? I’m keeping that and using it as a name for this entire 3 chapter arc of Chapters 8-10, and officially calling it the second arc. If you’re wondering Arc 1 is now titled “The Glimmering City,” and contains chapters 1-7. So it’s a minor shakeup for most of you readers. If you’re coming in for the regular updates it won’t really have an effect on you. To me, it’s a big deal, as I’m feeling much less bogged down in a single chapter and can create a bigger sense of progression. I’ve updated the cover pages for the chapters to reflect the changes, and I’ll probably make an Arc 1 cover as well. As a side note I’ve also hidden a little easter egg in Chapter 8. Go back and see if you can find some graffiti in the backgrounds of 2 of the pages. Enjoy. Gritty City Stories #263: Pink and Wordy.